When I was a kid, candy canes were the emblematic sign that the holidays had arrived. You received them taped to your Christmas cards, hung them on trees as ornaments, even stuck them in your gingerbread houses. They were the quintessential symbol of "Winter Wonderland". And now that it's starting to get a bit colder here in NYC, it's only appropriate that I honor the tradition in some way or another. This is by no means a look that everybody would rock, but I think it would be a cool thing to wear when you're letting your hair down for the office holiday party. 1♥ Even with such a dramatic eyeliner look as this, I like to create at least some definition to the rest of the eye with eyeshadow, so I've still prepped my lid with my trusty eye primer, the Lorac Behind the Scenes Eye Primer. 2♥ As I plan on using some darker shadows to define my eyes in a bit, I wanted to lay down a transition shade first. Side note: All of the eyeshadows that I'm using in this look (with the exception of one), are coming from the Lorac Pro Palette. With a medium size blending brush, I swept Taupe (medium brown) between my brow bone and crease, taking it from the outer corner all the way to where my eye meets my nose. 3♥ To give my eye that more rounded appearance, I'm going to start creating that faux cut crease look that I've been wearing lately. To do so, I took Sable (dark warm brown) on a smaller blending brush and focused that on the outer half of my crease, rounding it at my outer corner. 4♥ In order to deepen the crease and emphasize the round shape even more, I took Espresso (deep dark brown) on a pencil brush and really carved out the desired shape. This does create somewhat of a harsh line, so I went back in with the smaller blending brush (with no additional product) and blurred out just the very edges of where Espresso meets Sable. 5♥ You probably have already figured that I couldn't stop there...and you were definitely right. Using that same pencil brush, I added just the tiniest bit of Black to the outer crease. It may seem like a bit much, but I think that added definition in the outer corner really brings the look together in the end. 6♥ To clean up the faux cut crease, I used an old favorite of mine, Mac Pro Longwear Paint Pot in Soft Ochre. I switched between using a flat synthetic brush and an angled eyeliner brush when doing this because I found that the angled eyeliner really allowed me to make the shape more precise. 7♥ Soft Ochre is a very yellow-based paint pot, so to neutralize that I little bit, I patted Lt. Pink over it with the same synthetic flat brush from the last step. 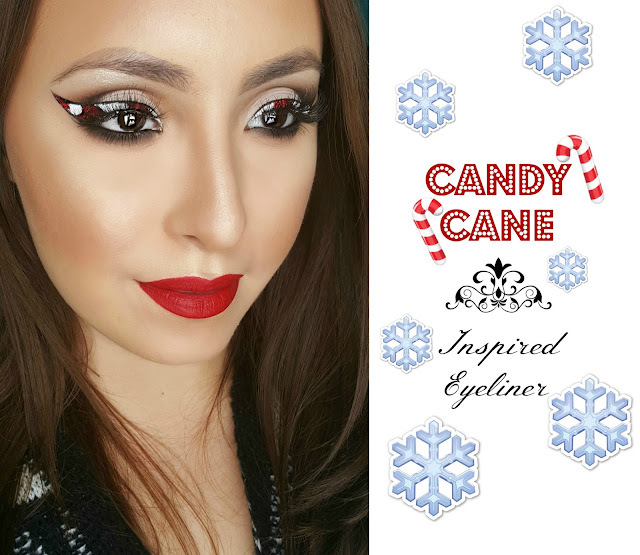 8♥ Create your winged eyeliner--this will serve as your guideline for the candy cane stripes. While this step is completely based on preference, I would recommend making the wing relatively thick as I did, so that you have enough room to play with once we get to the candy cane detailing. To create my wing, I used the Milani Eye Tech Extreme Liquid Eye Liner in Blackest Black. 9♥ Now on to the detailing. I started off by doing white stripes first because I felt that it would give me a bit more control in case the colors mixed. Using the NYX White Liquid Liner I created the stripes, slightly curving the ends so that it's not a harsh straight line and also leaving space for the red stripes. If you're worried about the white getting onto the rest of your eye makeup, you don't have to have it cover all of the black eyeliner underneath as the look gets outlined in black later anyway. 10♥ Add in the red. I've heard that using liquid lipsticks is great for this sort of thing, but, of course, do this at your own risk as they weren't created to be used on the eyes. Also, just remember to sanitize your product; you don't want nasty germs getting into such a sensitive area. 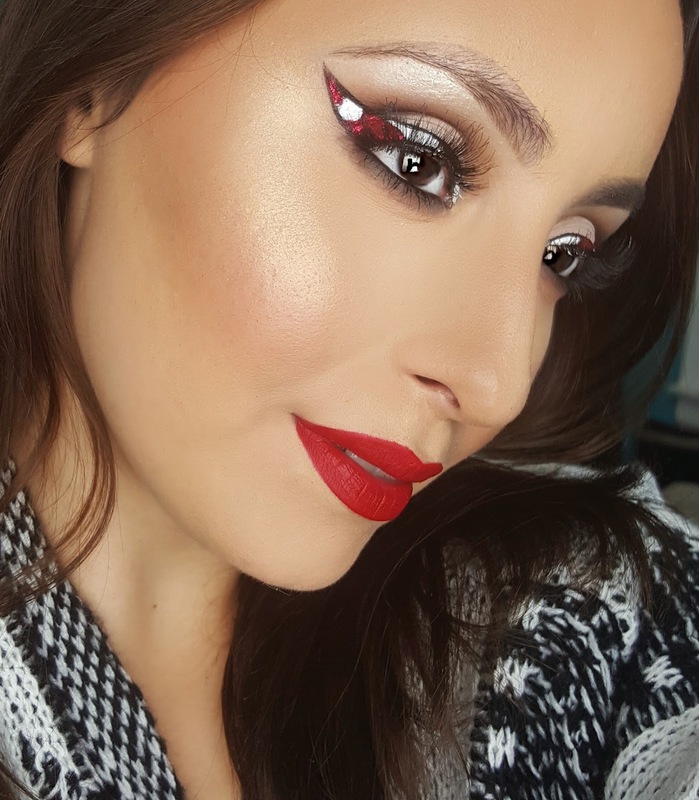 For the red stripes I used the Jeffree Star Velour Liquid Lipstick in Hoe Hoe Hoe. I dispensed a small amount of the product onto the back of my hand and worked from there with a tiny detail brush to fill in the remaining black spots. 11♥ The red just wasn't intense enough for me, so I decided to add some glitter on top of it. With the same small detail brush, I applied a thin layer of the LA Splash Splash Proof Sealer Base over the red only. I then patted Mac Red Glitter over the top of it for a brighter, more metallic shine. 12♥ Once the stripes have completely dried, outline them with the black liquid liner. This defines them and makes it pop more. 13♥ Lastly, just add your finishing touches. I smoked out my lower lash line using the Inglot Gel Liner in # 77 and Black and Sable eyeshadows from the Lorac Pro Palette. I also highlighted my brow bone with Mac Nylon Eyeshadow and added House of Lashes "Smokey Muse" lashes to top off the look.